Description: A 390 grain train to the Port of Albany rolls north near Old State Road. The empty bridge in the foreground is the old DLW Syracuse and Utica Branch. This segment of it was abandoned as part of the project that raised the overpasses at Beview St. The NYSW, who now uses the line, runs on the D&H to a point just north of here, reaching its own line via a new connecting track. 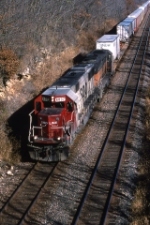 Description: A SOO Line train behind an SD60/GP40 takes the signal as it heads for Kansas City in November 1994. The CNW train from Des Moines in the background is actually waiting for a new crew before heading for KC. Description: SOO SD60 6037 leads a former Milwaukee Road GP40 towards Kansas City in November 1994 on the CP. Description: A southbound train is holed up short of the farm crossing at Afton waiting on a recrew. Quite the power mix. One oddity of the CR split was the chance to see Conrail power on the D&H, almost unheard of prior to that time. Description: CSXT Southbound Molten Sulphur Train K869 ( Chicago, Illinois to Mulberry, Fl. ) passing through Brownsand, Ga. Description: 413 starts out its trip north passing the Binghamton Agway feed mill. Description: CP train 419 swings around the big curve near MP 249 between Barton and Waverly with a mixed bag of CP and SOO power, a common sight on the Tier. Today they have 91 cars in tow. Description: CP 419 gets a good roll going as it heads into the curve at MP 220 in Endwell. Description: Where once a pair of semaphores stood, now are a pair of tri light signals, standard for Conrail at the time they were installed. CP train 419 rolls 91 cars between them. Description: At CP St-Luc yard. Description: Trains 512 and 513 were established as Taylor Turns to run traffic between the two yards, and presumably to work any industry along the way, which by this time was precious little. We see a pair of SOO units-the trailing 6607 was originally SOO-approaching East Binghamton. Description: A SOO 60 and the only two CP Barns in dual-flag paint leads this train through Bangor just as the sun went behind the cloud! Description: SOO 6037 leads CP 8784 on train #497 between West Salem and La Crosse on a balmy December day! Description: Standing next to fellow site member Nate Dahms, here is my version of train 497 at Red Wing behind SOO 6037 and CP 8784.